A haunting film. 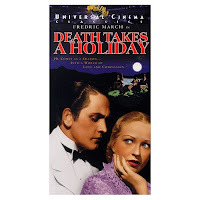 Death (Frederic March) is curious to know why humans are so afraid of him. He comes to Duke Lambert to ask him a favor. Death wants to take three days off to see how humans live first hand. He is hoping to find out the reason why he is so hated. The Duke reluctantly agrees and promises not to tell the other house guests who he really is. Death takes the human form of Prince Sirki, a friend of the Duke's. As he begins to spend time with the assorted group he begins to fall in love with Grazia, the daughter of one of the house guests, Princess Maria. Now all the guests except for Grazia are beginning to become afraid of Prince Sirki. His holiday is almost over and he decides to take Grazia with him when he leaves. Will the guests be able to save Grazia or will she go with death willingly. This movie was wonderful. I can imagine in 1934 it was very disturbing. Fredric March was scary as death/Prince Sirki. Evelyn Venable was also terrific as the object of death's love, Grazia. There have been three remakes of this movie. There was a made for TV version in 1971 with Myrna Loy and Melvyn Douglas. There was also a 2004 version that was made in India. However, the most famous remake was Meet Joe Black in 1998 with Brad Pitt and Anthony Hopkins. I feel though that the original version is well worth the effort to find and watch.